In 2018 I have great pleasure in welcoming this beautiful new Italian Knight paper to my range. It is now the only paper that I use in all of my journals. A beautiful off white (creme) colour, it is silky smooth to the touch. And accepts inks and fountain pen beautifully. I've had lots of fun exploring different inks. Including walnut ink! Love the results and hope you will too! Which Paper Weight Should I Choose? I use both weights of 90gsm and 120gsm in the journals and albums. The choice for a journal for writing. Thick enough to allow writing on both sides of the pages while maintaining the feel of a fine journal. Will also hold photographs and keepsakes of lighter weights. 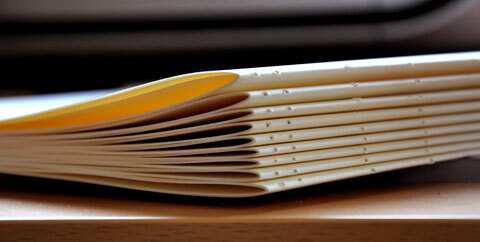 Results in an organic form to journals - the pages are supple and will bend to the shape of the journal. Ideal for people like me who like their leather writing journals to mould into a soft shape. The choice for a journal for sketching, photographs and keepsakes. Writing is still a joy and the heavier weight allows additions to be added to the page. I have even used it for light watercolours. It will buckle slightly under heavier washes but works well for light washes. Ideal for pencil, pen & ink, crayon and even light pastel. Works really well in Photo albums and Guest Books. Adds a stiffer more rigid form to journals. *Please email or phone if you need help choosing - happy to advise if I can.